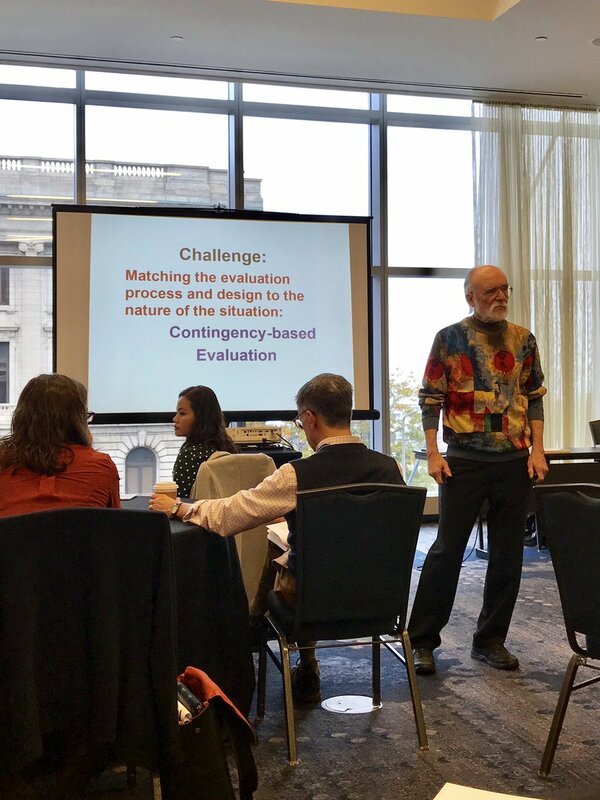 Participant question: A lot of the evaluative work I am expected to do is 'prove' something. How can I do DE while meeting the expectations of leaders to prove programs? A: From phil. of science and sociology of knowledge, we can never prove anything, but only disprove things. We don't have a perfect knowledge. We don't know what dark matter is and it comprises the majority of our universe. We are still relatively clueless how brain works. Decision makers don't want to hear that, so the important thing to ask is, "What degree of evidence is needed to make a decision?" Don't argue about proof. Let's talk about the kind of decisions you are making. What you are trying to decide? What level of certainty do you feel you need to make that decision? What kind of evidence would help you make that decision? MQP on causal inference versus causal mediation: "A well done case study is much stronger evidence than a well designed RCT. RCTs don't allow you to connect the dots." 'Best Practice' is a political term, not an empirical term. If you deploy the term 'Best' it implies you have compared all the alternatives, you have perfect information, and that context doesn't matter. There's effective, promising, evidence-based practices, but not 'best' practice. If you hear yourself using that phrase, slap yourself, wash your mouth out with soap. It is an insidious form of thinking that is not helpful. Principles versus rules: Stop sign is rule. It is absolute. Only evaluate if it is followed. Principle is defensive driving. Rules are highly descriptive, detailed. Principle provides guidance, but have to adapted to context. "No screens under age two without interaction." Screen's were not the problem, using screens for babysitting was the problem. The principle is interaction. 1. Is the principle meaningful to those to whom it is meant to provide guidance? 2. Is the principle adhered to? 3. If adhered to, does it lead toward desired results? 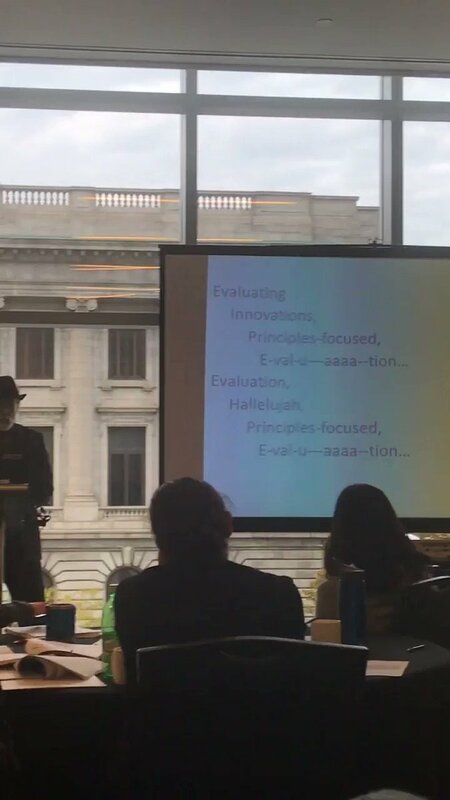 SMART goals are the dominant framing in evaluation. In contrast to smart goals, MQP offered the 'GUIDE' framework which identifies the criteria of what constitutes a good principle. "A value is a belief statement, an opinion. It becomes a principle when it has an action verb with it. They tell you how to act." ...and from the other eye with the strengths of Western knowledges and ways of knowing…and learning to use both these eyes together, for the benefit of all. Two-Eyed Seeing is the gift of multiple perspectives treasured by many Aboriginal peoples. It is the requisite Guiding Principle for the new consciousness needed to enable Integrative Science work, as well as integrative, transcultural, transdisciplinary or collaborative work. This principle chimes with the concept and value of 'Hybridity' that critical peacebuilding researchers and evaluators point to as a means for emancipating ourselves from an ineffective, unsustainable, coercive, and potentially violent form of responding to violent conflict. An example of turning values into a principle is with my work @everydaypeacein. We believe communities affected by violence are best positioned to determine the effectiveness of peacebuilding initiatives (value). We place communities at the heart of measurement (principle). Participant Question: Any good example of Two-Eyed Seeing as applied to the Sustainable Development Goals? ...quality of quinoa and branding, trying to combine indigenous traditional knowledge with longer term applications that are a part of the agriculture science that relates to SDGs: 2, zero hunger; 5, gender equality; and 15, life on land. Much of what is being shared is that where there's no road map, principles serve as the compass needed to navigate complexity. 1. Identify principles in draft form. 3. Interview youth, review their case file, interview a nominated staff person. 4. Synthesize information and write case stories. 5. Review stories with youth. 6. Analyze stories, looking for principles and emergent themes. Reviewing the data, one of the emergent principles identified that contributed to positive outcomes was 'Trusting Youth-Adult Relationships'. Part of this work is making sure the principles identified can be situated against what they are not, so they have teeth. Recipient of homeless shelter services was traumatized as a child in shelters. They would not stay in shelters, and was therefore technically ineligible for secondary services. The shelter skirted the rules and allowed the recipient to sign in, receive services and leave. The 2005 Paris Declaration is an example of using principles in an action-oriented way to improve aid on development impacts with specific implementation measures and a monitoring and evaluation system. Evaluators were tasked to evaluate the implementation of the Paris Principles by the metrics of the DISTANCE traveled, DIRECTION to or away from principle, and SPEED of travel. National eval teams went around to ministries and aid organizations. Nearly universal response was, the what? Evaluator had to carry one-page explanation, the evaluators became the major mobilization of implementation. 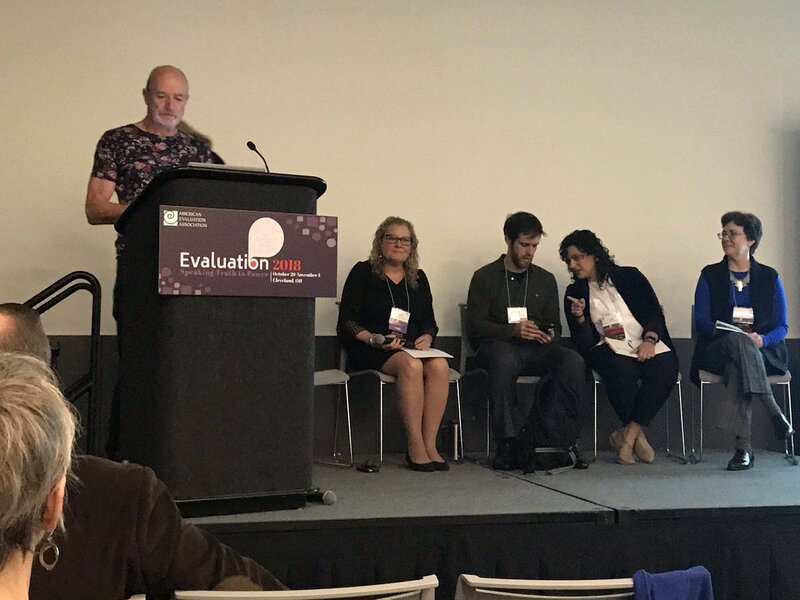 This evaluation had a high-degree of process use, referring to the impact that evaluation has by simply taking place, not just generation of findings, but the learning that happens of doing an evaluative exercise that changes how people are doing things. Blue marble evaluation: new evaluand is the entire earth, for which there is no counterfactual, so you don't have to put up with any RCTs! Participant Question: How to address potential issue of bias with DE. Any protections to put in place? Minimize bias? ...after US invasion of Iraq, and no WMD found, intelligence community was seriously demoralized, they had been co-opted. Process corrupted, data, findings corrupted led to where we are today. Intelligence community got together. Addressed issue of bias and tried to figure out what went wrong. Tried to restore credibility. They generated the Rigor Attribute Model. They realized that between the 13-15 intelligence agencies, all were using same informant, code named 'Curveball.' None would share who informant was. What looked liked triangulation, was actually a closed loop. They identified 8 Principles for enhancing credibility of findings, which were all focused on thinking. They concluded that, RIGOR DOES NOT RESIDE IN METHODS. RIGOR RESIDES IN RIGOROUS THINKING, on how to make sense of data. Key question for Developmental Evaluation: What don't you know that if you did know would make a difference to what you do? Epilogue: For those working in international development, my colleagues at @DIAL_community steward the #DigitalPrinciples, which are the result of an almost now ten-year, sector-wide effort to identify action-oriented guidelines for using technology to achieve development goals. These can be serve as the basis for any Principles-focused Developmental Evaluations of tech-enabled international development initiatives. Bob Williams: How could we make a system that speaks truth to power? We are trying to do that in real time this morning. We need to focus on boundaries. Setting the boundary is what speaks truth to power. Many people think holism is about thinking and including everything, that is not a system, that is cosmology (history and study of universe), and even cosmologists have boundaries. I was going to say anything about this thread because today is Christmas and frankly I do not care to argue on Christmas Day, but I can't put it off for longer. This is not going to be an argument. Read my pints below and learn if you want to. As I said before, the thread is good, but up to a point. The only good point the thread made is about the need for Nigerians to see and recognize opportunity. But there's where it's goodness stops and it's "badness" starts. criticized Nigerians for not "seeing" opportunities that people of other nationalities see when they come here. … in which he was interviewed under suspicion of misuse of public funds and false accounting. Naushad Abdulla (NA) says he understands his right not to answer if he chooses. 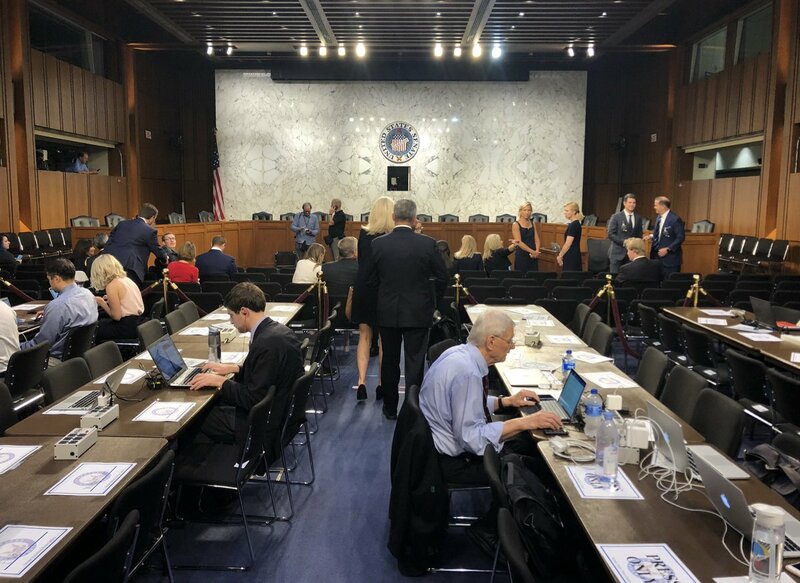 Still early here in the hearing room, but this will be my thread for Day Two of the Brett Kavanaugh confirmation hearings. Today: Each senator on the committee gets 30 minutes for questions. If they all take their time, and none go over (ha! ), that’s 10.5 hours. 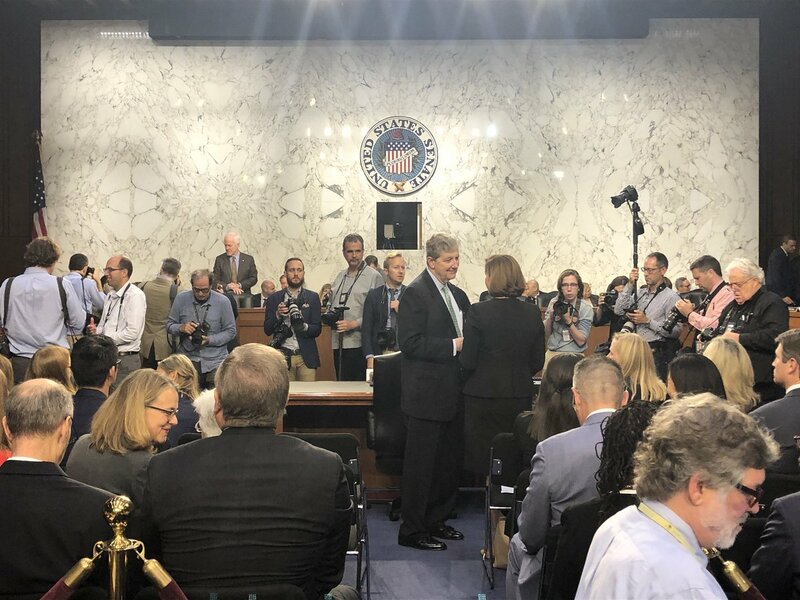 Here’s Sen. Kennedy, talking with Kavanaugh’s wife, Ashley, in advance of Day Two. Five people in a row, one by one, just interrupted the hearing, and were taken out one by one. Starting in August, I’m an associate professor! I learned a lot in my first 5 years of professordom. Here are a few, for any of you starting out or interested in becoming faculty. Curious to hear others’ takes. Create a streamlined research program and if projects fall outside it, say no to them. I spent the first year chasing various funds and projects. That’s ok but don’t do that for more than a year. Establish meaningful collaborations. Ones that fill you up and help you learn more things. This increases research productivity, but for me the best part was connecting with new people. Starting up my #ATLvsDAL tweet recap. Should be a fun one. Follow this #thread for all my takes on the Falcons win over the Cowboys. Opening defensive drive for the Falcons was pretty solid. In real time, looked like the holding call on Trufant was ticky-tack. On replay, there's a little bit there. I've got mixed opinions on it. Yet another interception called back due to penalty. Vic, I'm gonna need you to stay onsides, buddy. Starting my #ATLvsDET tweet recap. Follow this #thread for all the latest and greatest takes. Andre Roberts didn't bring out the kick this time. In both of the last two games he attempted to return the opening kickoff.